This delicious Blueberry Jelly Bean Smoothie seems so bad, but it’s soooo good, in many ways! It’s packed with healthy ingredients and tastes delicious. It all started Saturday morning when my son decided he was in the mood for donuts. He wanted to get some for his Dad and Grandpa who were doing some work on the car. How could I say no to that? So off we went to the donut shop. I love the taste of donuts, but they make me feel horrible (can you say sugar crash? ), so I needed something delicious and sweet that I could eat and not feel like I was missing out. As soon as we got home and the men were all gobbling their donuts, I went into the kitchen and made myself this delicious shake. I even shared some of it with my 14 year old son. He drank it all down, commenting that it was “actually good” (typical teenager) and added with a smile “It tastes like a blueberry jelly-bean.” (Hence the name 😉 ) That’s good enough for me! This recipe is officially approved by two generations in our house! 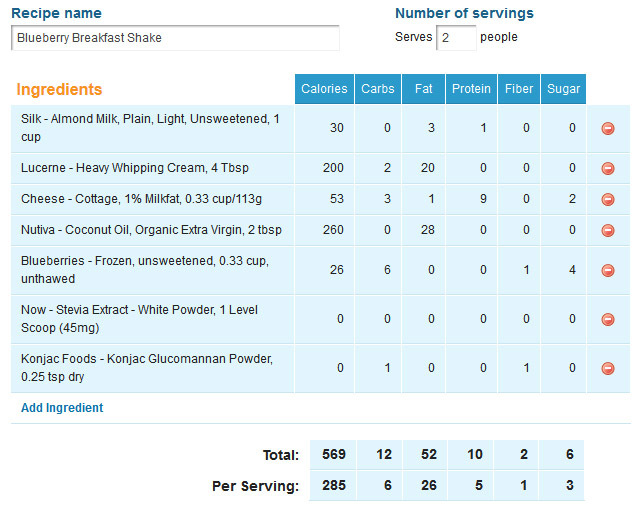 In your blender, pour 1 cup of unsweetened, plain almond milk. Add in 4 tbsp. of heavy cream and 1/3 cup of 1% cottage cheese. Blend it all up until the cottage cheese lumps are completely gone. Next, while the blender is running, drizzle in 2 tbsp of coconut oil, blending enough to emulsify the oil into the mixture. Next, add 1/3 cup of unsweetened, frozen blueberries. Blend well, and add sweetener to taste. I used Kal Pure Stevia Extract Powder. Finally, with the blender still running, slowly add in 1/4 tsp. of glucomannan powder. Blend thoroughly. If you’re not familiar with it, I describe it in my post “Strawberry Lemonade Slushy.” Head over there and read up on it. You’re done! Now pour it into two glasses, find someone to share with, and enjoy. The nutritional information is posted below. Click on the picture to see it larger. Follow my THM Pinterest board for more great recipes! Comment away below if you have anything to share, and by all means, sign up for email updates by adding your email address in the space on the upper right! Trim Healthy Tuesdays at Stacy Makes Cents & Gwen’s Nest. Slightly Indulgent Tuesdays at Simply Sugar and Gluten Free. Traditional Tuesdays at Intentionally Domestic. Wellness Wednesday at Intoxicated on Life.